Examples, solutions, videos, worksheets, stories and songs to help Grade 5 students learn how to find the area of parallelograms. 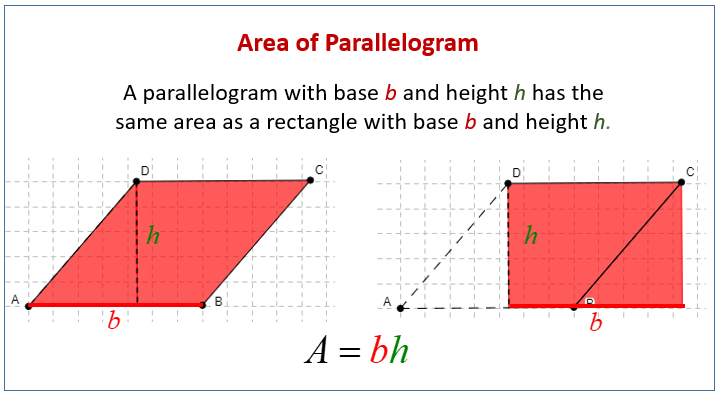 The following figures show that a parallelogram with base b and height h has the same area as a rectangle with base b and height h. Scroll down the page for more examples and solutions. How to use a formula to find the area of a parallelogram? How to Find the Area of a Parallelogram?